Now that I have 3 children, one of whom has special dietary needs, I feel I must develop and stick to a schedule. I purchased the book Managers of Their Homes and read it through in 2 days. Just a few minutes ago I finished putting the schedule together. I must say, their method makes it so easy! I filled in the obvious things, like meals and the baby’s nursing schedule. Then I filled in the kids’ schedules and the gaps. My husband plans on making a schedule for himself–though if he will just make meals on time and help with breakfast prep and be available to spend 1/2 an hour with the baby while I shower, I’ll be content. The way it is structured, I’ll practically be able to run the house by myself, including teaching 1/2 hour of preschool/kindergarten and starting Gislaine on the piano. I also plan to do 1/2 hour of mending or sewing and a half hour working on my blog each weekday except Tuesday (shopping day). I suspect that we will test the schedule on Monday, but Tuesday is not only my shopping day but also our anniversary, and Wednesday I have an appointment for physical therapy that I couldn’t get scheduled for Tuesday, so it will be interesting to see how those days go. It is also the lament of many a housewife that they can’t stay on schedule when their husband is home. I have mine for another 5 weeks. This should be interesting! Have you ever done a schedule? How did it go? I have very strong opinions on Daylight Nuisance Savings Time. And I thought I’d share them. First of all, it doesn’t save time at all. There are still 24 hours in a day. And on days like today, it actually steals an hour! Granted, it gives it back in the fall, but by that time, I’ve forgotten how annoying it was to have it taken in the first place. It’s like someone stealing the $20 bucks I planned to buy lunch with, only to bring it back a month later. By that time, I have long gotten over the loss, you know! Where did DST originate? Well, since I don’t have time to research that (and since I’m sure you’ve already read something on that topic within the last few years), let’s just say that what I remember being told is that farmers needed more daylight at the end of the day to get their work done. But that makes no sense. I mean, farm equipment has lights, just like cars do. Why not just start an hour earlier in the morning? Or are those poor farmers supposed to skip an hour of sleep every night in the summer? Not all states and countries have DST. Arizona doesn’t. I have a friend who dreams of moving there. Her health is very unstable and requires adherence to a very strict schedule. The time change messes with that. Although she changes the times on her schedule to adjust as though there were no DST, it makes activities like going to church difficult. Mexico has DST, but it starts later and ends earlier–as we discovered once when trying to attend a function at a church across the border. It seems that it used to start later and end earlier in the US, too, but someone keeps pushing the dates back to make it longer. Growing up, we called DST “Man’s time” and the regular time “God’s time.” I still think of it that way. I figure, what’s the point of changing it at all? Just pick a time and stick to it. The changing back and forth every year is annoying. Thankfully for me, we worship on Saturday, so we don’t have to be anywhere Sunday morning. That makes it easier to adjust–we don’t need to lose the hour of sleep. Unless, of course, we stay up an hour later the night before! So those are my thoughts. 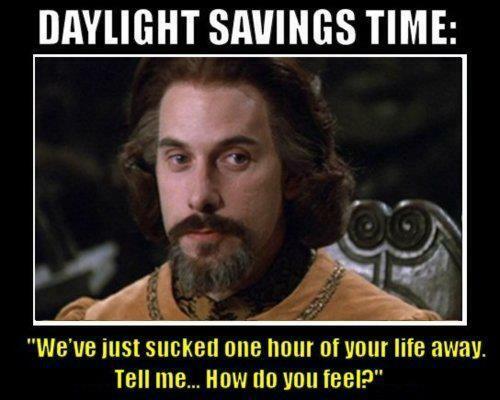 What do you think about Daylight Savings Time? Do you like it? Dislike it? Why? Please share!